How to paint a dahlia flower blossom. One that is fiery red using oil paints. Home > Beginner Tips from my easel > How to paint a dahlia flower. Below you'll find the speed video I did for this painting. 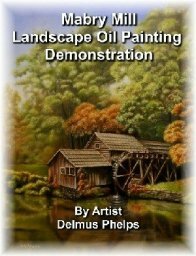 As you notice, there are no toning of the canvas, no brown under painting, and no gray or dead layer! Why? Good question. I'll try to answer it for you below. In the meantime, here's the video. 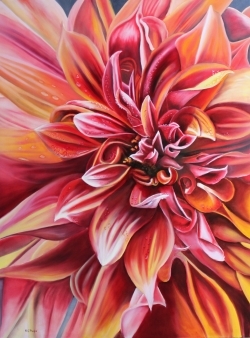 More details in how to paint a dahlia in oils. Now, if you've enjoyed the video, if you've learned something or just like the music, please consider clicking the thumbs-up icon in the upper right of the video screen, or even click the YouTube icon in the lower right to sign in and leave a comment. Did you know that YouTube searches are beginning to overtake regular searches on the internet? Yep, I even learned how to change the brake pads on my wife's Kia Sportage in less than 20 minutes each side with YouTube! In "liking" my video, you'll help other artist's in finding this site. Now back to the explanation of the why no under-paintings. Well, this is a technique that follows some of histories earlier painting techniques with egg tempera (centuries old). Using mostly glazes, the paint is applied in thin layers that allow light to pass through the layers. The luminosity of the reds and yellows (as they are transparent colors) can be heightened by allowing thin layers to be applied and the white background serves to bounce light back through the paint films. Like a stained glass effect. Three full hours of video has been compressed into this 8 minute session shown, and it only shows part of the first layer. The first layer took a few hours more to complete. Each successive layer was then completed after the painting dried thoroughly using an accelerator. Also a coat of retouch varnish was applied between each coat to enhance the stain glass effect. The photo is pretty good, but to see it in person is so much better. 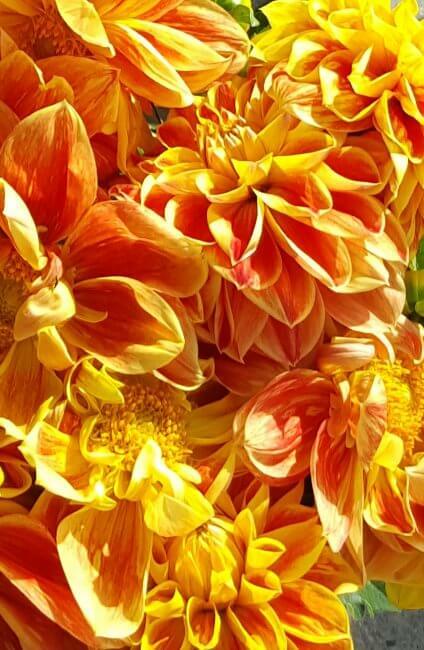 Paint a dahlia, how to get started on your own! One of the things that I really enjoy is visiting floral shops, garden centers, and floral stands in major cities. Some of my best reference material come from these places. Not having much of a green thumb myself, I find it best to leave beautiful flower growing to the experts. With the heavy use of my phone's fantastic camera, I've found yet a new source of these reference photo's. My SLR is still used for painting photographs, filming and such, but the excellence of the newest phone camera's has me so excited. Here's an example. 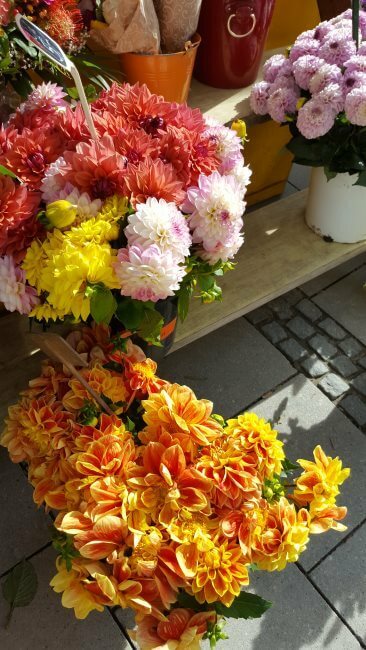 The image below was taken while walking thru Munich, Germany where many flower stands a open in the city center. And this became the subject of a new painting. Stay tuned as I will post some of the "works in progress" shots of it's creation. Sign up for my newsletter and never miss a new demonstration. Click Me to get more info! Once you get your reference material together, you too can paint a dahlia like you mean it!